The game of Monopoly is one of the top-selling and best-loved board games in history. Players use play money (often called "Monopoly money") to buy and sell real estate. The goal of the game is to bankrupt the other players, and the best way to achieve that is by owning "monopolies" of certain property types. Over 750 million people have played Monopoly. Monopoly is a game for between 2 to 8 player that takes anywhere from 5 to 15 minutes to set up and anywhere from 90 minutes to 6 hours to play. The game is most often associated with Parker Brothers, which is owned by Hasbro. The Monopoly board has 40 squares, 28 of which represent property that a player can buy. Of those 28 properties, 22 of them are named after streets, 4 of them are railroads, and 2 of them are utility companies. The board also has 3 community chest squares and 3 chance squares. There are also 2 tax squares, a luxury tax square and an income tax square. The final 4 squares are "go", "go to jail", "jail", and "free parking". All of the properties on a standard US Monopoly game board are named after locations in Atlantic City. 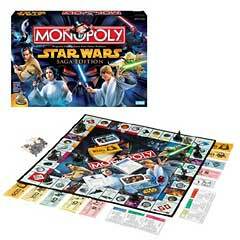 Besides the board itself, the Monopoly boardgame includes Monopoly money in denominations from $1 up to $500, pewter tokens to represent each player, dice, propery deeds, and chance and community chest cards. The game also includes wooden or plastic houses and hotels which can be bought and placed on property that a player owns. Copyright © 2006 - 2009 Monopoly Man. All rights reserved.